Activate ScreenSaver instantly - ScreenSaver Now! ScreenSaver Now! is to activate your ScreenSaver instantly, that is to turn your system into ScreenSaver mode quickly. Please run the "ScreenSaver Now!" command from the tray icon menu. Click the tray icon located on the bottom right of the Windows desktop near the clock and select "ScreenSaver Now!" in the shown menu. This will instantly launch your ScreenSaver! You can run the default ScreenSaver installed to Windows running "ScreenSaver Now!" command. If no ScreenSaver was installed, that is "NONE" is selected in the Windows "Display Property", "ScreenSaver Now!" is disabled. When to run this command? Once you want to activate your ScreenSaver, run "ScreenSaver Now!". You may have ever left your computer, but your ScreenSaver was not activated and you need it to be activated immediately to hide all the sensitive information in your screen. Normally, to activate your ScreenSaver, you may have to right-click the Desktop, click the Screen Saver tab, then click Preview. 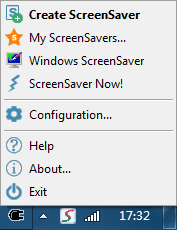 Now with !Easy ScreenSaver Station, you can activate ScreenSaver from your desktop(system tray icon) instantly. The "ScreenSaver Now!" command helps you to activate ScreenSaver easily and quickly.